What is Mohs Surgery? What are the advantages of Mohs Surgery? Mohs micrographic surgery is a safe and highly effective technique whereby skin cancers are removed under complete microscopic control. 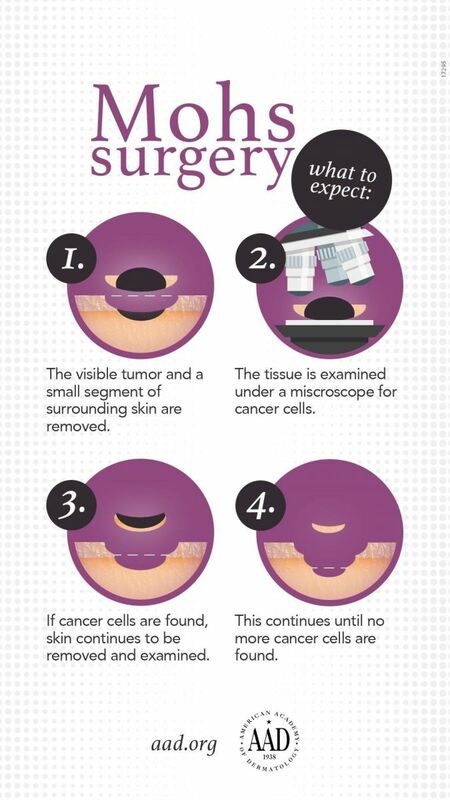 During Mohs surgery, a layer of skin is removed around the visible cancer. Detailed maps are then drawn of the area, and 100% of the tissue margin is examined under the microscope to be sure all the cancer and its roots are gone. If any cancer remains, that exact area of involvement is sampled again and the entire process is repeated until the cancer is totally eradicated. Mohs Micrographic Surgery offers the highest potential cure rate (99%) for skin cancer. By using the mapping technique and complete microscopic control, the Mohs surgeon can pinpoint the areas involved with cancer that are otherwise invisible to the naked eye. Mohs is a skin sparing technique. The surgeon removes the least amount of tissue, offering a superior cosmetic result. Mohs surgery involves the use of local anesthesia applied to the area where the lesion is, to appropriately numb the area before surgery. When the anesthesia is in place and the area is numb, the section of tissue that contains the visible cancer will be removed. A temporary dressing is applied when the tissue removal is complete. The tissue is then prepared by our technicians for microscopic examination. Our physicians will examine the tissue and determine if the entire skin cancer has been removed from the area. If any additional skin cancer is detected, the process will be repeated from tissue removal through microscopic evaluation. This will continue until there is no evidence of skin cancer left in the area. Once the skin cancer has been completely removed, a dressing will be applied to the area, post-operative instructions will be reviewed, and the patient will be discharged. The surgical repair of the Mohs surgery site is performed the following day at our Ambulatory Surgery Center.